It is formed by a peak (shoulder), followed by a higher peak (head), and then another lower peak (shoulder). A "neckline" is drawn by connecting the lowest points of the two troughs. The slope of this line can either be up or down. Typically, when the slope is down, it produces a more reliable signal. 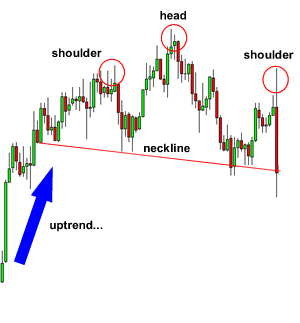 We can also calculate a target by measuring the high point of the head to the neckline. This distance is approximately how far the price will move after it breaks the neckline.